So, why do we have happy feet all of sudden? 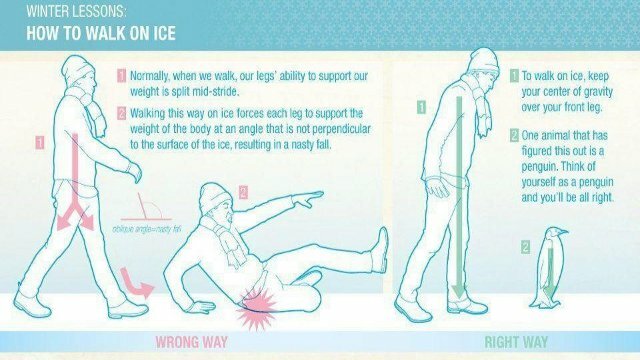 Well, according to Info Graphics, our feathered friends down in Antarctica could teach us a few things about how to safely walk (sorry, waddle) on ice! ...but when you bring ice into the equation, it forces each leg to support the entire weight of your body - resulting in some of the ugliest and nastiest epic falls. So, in order to stay safe out there, you got to think like a penguin. Keep your center of gravity over your front leg and ... just... waddle! Okay, no one ever said you'd actually look cool doing it, but at least you won't bust your tail feathers!